These are just the highlights. He did a bunch of other stuff too. The inmate also requested that Michael Vick stop "physically hurting (his) feelings and dashing (his) hopes”. You can read the entire handwritten complaint, here. Trust me when I tell you that it is worth a minute of your time. WOW. That is the definition of amazing. I am actually very impressed with the language of the lawsuit - someone must be reading up in the prison library! Looks like Vick is in some real hot water now! That poor man needs serious help and he's not going to get it in prison. 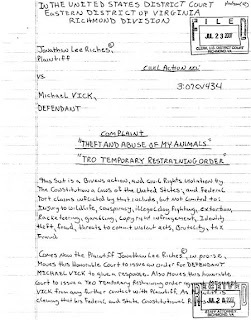 The guy who filed the law suit or Michael Vick? I think they both need help but I think the help that Michael Vick needs is EXACTLY the kind of help that is given out in prison. Poor Mr. Riches©. I don't care about any dog-fighting scum bag. Mr. Riches is at it again.